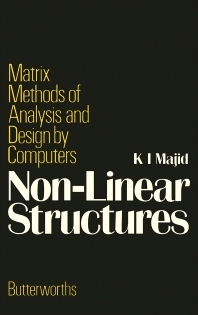 Non-Linear Structures: Matrix Methods of Analysis and Design by Computers presents the use of matrix methods of structural analysis suitable for computers. The book consists of 10 chapters. In the first chapter a brief introduction to the behavior of structures in general is given with reference to the linear elastic and simple plastic methods of structural analysis. Chapter 2 is devoted to linear matrix methods, both force and displacement. Chapter 3 examines the stability of an individual member with various end conditions. It also derives the stability functions used in Matrix force and Matrix displacement methods. Chapter 4 tackles the elastic stability of complete frames. Chapter 5 deals with the elastic instability of frames. The sixth chapter covers the elastic-plastic analysis of frames. This is followed in Chapter 7 by a number of approximate methods for the evaluation of the failure load of frames without following the sequence of hinge formation. The last three chapters are devoted to the design of structures and the non-linear aspects of design problems. A description of non-linear programming by piecewise linearization is included in Chapter 10. Structural engineers, architects, researchers, and engineering students will find the book useful.